A couple strolls through the Princeton Battlefield State Park. The Institute for Advanced Study is proposing to build a new site beyond these trees. On January 3, 1777, gun smoke, cannon fire and musket balls filled the air of Princeton, as American forces under General John Sullivan’s command cornered British-hired Hessian mercenaries near Princeton University’s Nassau Hall. British forces surrendered as General George Washington and his troops drove another regiment into the woods while shouting, “It’s a fine fox hunt, boys!” Washington’s victory at the Battle of Princeton boosted morale and convinced others, particularly the French, to support the nascent American rebellion. Two hundred and thirty-seven years later, the Institute for Advanced Study and Princeton Battlefield Society (PBS) are engaging in what PBS calls the “second Battle of Princeton.” This time, at stake is a plot of land considered by PBS to be pivotal to the battle. In 2003, the Institute developed plans to build 15 additional housing facilities for faculty and visiting scholars on a seven-acre parcel of land east of the battlefield. For the past decade, the Institute has faced sharp opposition from PBS. In the latest development of the ongoing drama, last month a research management and consulting firm hired by the Institute commenced its search for artifacts. The resulting data and any artifacts found will be made public, according to an Institute press release. Opponents of the housing expansion argue that the Institute has other land available on which to build. But Christine Ferrara, an Institute spokeswoman, disagrees. “More than 75 percent of the Institute’s own land is protected from development by the Green Acres easement, covering 589 acres,” she wrote in an email to the Princeton Summer Journal. “Outside these protected acres, the planned site is the only one not intruding on the central axis of the academic campus that can accommodate the number of units needed,” Ferrara explained. Over time, rising housing prices have made homes around the Institute less affordable to its faculty, Ferrara said. 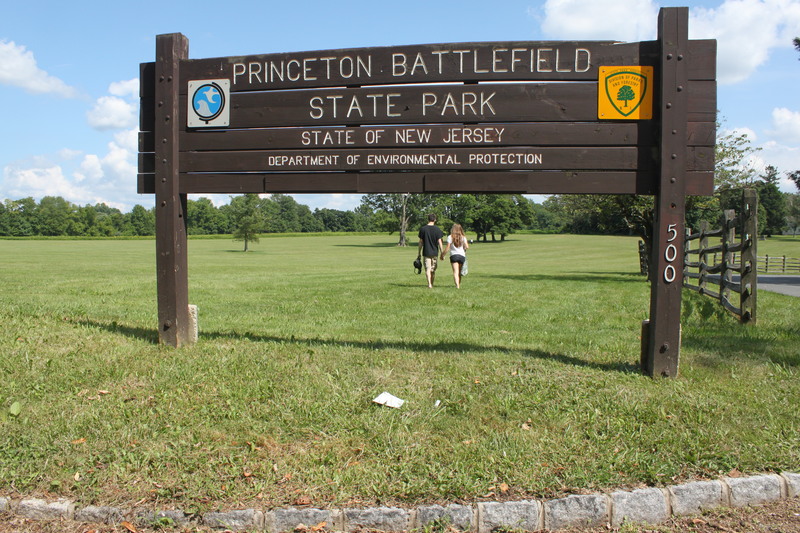 She noted that the Institute’s sale of 32 acres of land in 1973 to the State of New Jersey for the purpose of increasing the size of the Princeton Battlefield State Park came with the understanding that the Institute could develop on the land east of the park. PBS president Jerry Hurwitz denies this claim, and in an interview with The Daily Princetonian, PBS attorney Bruce Afran cited a 1992 agreement between the Institute and the Princeton Township that he says prevents the Institute from developing on the proposed site. Ferrara, in an email, stated the Institute hired Hunter Research, Inc. and The Berger Group over the past decade to survey the planned project area. Hunter Research subcontracted the Battlefield Restoration and Archaeological Volunteer Organization for the metal detection portion of the survey, according to the president and founder of BRAVO Dan Sivilich. In total, the groups found approximately 50 artifacts over a 15-plus acre area, according to Ferrara. PBS used funding from the National Park Service’s American Battlefield Protection Program to hire John Milner Associates to conduct its own study of the proposed building site. They found that the site was a crucial part of the battle itself. The Institute hired historians, including University of California at Berkeley history professor Mark Peterson, to test the validity of the Milner report. Peterson concluded the report was inaccurate because it employed questionable methodology. In March 2012, the Princeton Regional Planning Board unanimously approved the Institute’s initial development plans after both sides presented their findings, according to an Institute press release. However, the Institute was required to conduct an archeological survey of the proposed building site prior to starting construction. That same year, the Princeton battlefield was classified as one of the 11 most endangered historic places in the United States by the National Trust for Historic Preservation. Correction: A previous version of this article incorrectly stated that the Institute was to build on a 22-acre parcel and that the Institute hired the Battlefield Restoration and Archaeological Volunteer Organization. This entry was posted in News and tagged Institute for Advanced Study, PBS, Princeton Battlefield Society, SJP2014 on August 11, 2014 by pusjp.